Hello again! Today we bring you several bits of exciting news about Sidekick for Android. First up, version 1.2 of Sentinels Sidekick for Android is now available via Google Play and the Amazon Appstore for Android. The main new feature of version 1.2 is the inclusion of high resolution official card artwork from the Enhanced Edition of the game. All Enhanced Edition Heroes, Villains, Environments, and target cards are represented. 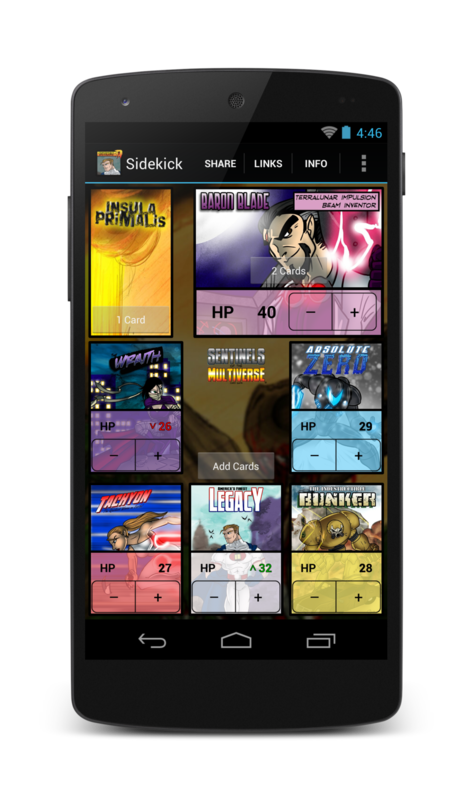 Now that Sentinels Sidekick for Android supports official artwork, we’re working on adding downloadable artwork packs for the expansions. We’re also building support for notes & effect tracking and the Vengeance expansion. We can’t promise exactly when the next update will be ready, but we’re working on it as you read this. If you don't see your country listed but would like Sentinels Sidekick to be available, please feel free to let us know. We need to set up tax reporting for each country we add to Google Play, so if it’s reasonable, we’ll get on it just as soon as we can. Last but not least, you might have noticed earlier this week that we released some info about the upcoming Sentinels of the Multiverse video game. What? You didn’t? Well, you can go check it out here.